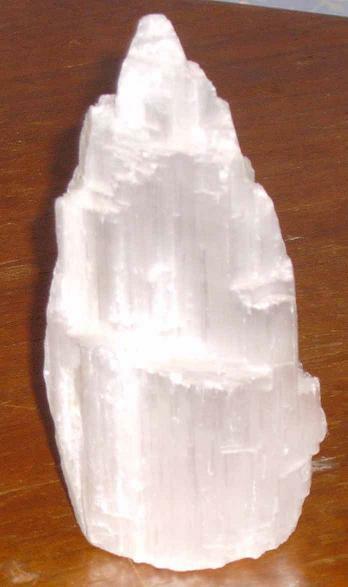 Selenite is another form of gypsum that has a uniform structure and more clarity than gypsum. Chemically speaking, this monoclinic stone is hydrous calcium (calcium is found in mica of mineral makeup) sulphate. It resembles Satin Spar or fibrous gypsum and Alabaster. The formation of Selenite is a result of evaporation in clay beds near hot springs. Since it has a hardness of two, some Selenite crystals may even bend in your hands and are very flexible and soft. Selenite can be found in different colors like golden brown, green, white, grey and even colorless needle like crystals or even tabular crystals. All colors have their own meanings and healing abilities. Though the best quality Selenite is found in Mexico, deposits have also been found in Greece, US and Australia. Selenite helps in enhancing our sphere of awareness and clearing our minds. It can also be used for past life or even future life access. The future lives shown by this crystal is a probably future which may become certain if we continue along the same path. All that needs to be done is to achieve a meditative state and use the thumb or finger to rub the crystal. Selenite also helps in enhancing judgment and achieving all the materialistic goals in life. Thus, this crystal helps in eliminating reserve and helps in developing an unbiased judgment about issues. It helps a person to develop a bond with the super conscious and overcoming the perceptions and preformed opinions in life. It helps people to understand the situation thoroughly and even access a person's inner turmoil to make a sound decision. Selenite is useful in enhancing flexibility in muscles and even aligns the spinal cord while removing all kinds of energy blockages. Physically, this crystal can help in preventing the harmful effects of free radicals that cause ageing and other diseases. It is a sulfate rock. Sulfate helps alleviate and heal skin conditions such as psoriasis and eczema. It helps in preventing poisoning due to teeth filing. It can help in stabilizing problems like epilepsy and even prevent and cure problems associated with the skeletal system. It can also help people to have longer and healthier lives. Selenite is a stone that helps in activating all the upper chakras, including the crown, third eye and Soul star chakra that is located above the head. A blast of energy from a Selenite wand actually feels like a cool draft of air in the region of the third eye. This stone is perfect for clearing all kinds of negativity from the astral and the physical body. It enhances the effects of crystal healing, which is why most crystal healers use Selenite wands for their work. It works well with other stones, which is the reason that many people attach other stones with the Selenite wand for the desired effect. Selenite can help in meeting with beings of the higher planes such as the guardian angels and spirit guides for all kinds of guidance. It also helps in aligning the chakras. Selenite is a perfect stone for understanding and realizing the Truth and the higher purpose of life in its crystal application. It corresponds to the element wind and vibrates to number 8. The zodiac sign for this crystal is Taurus. This self-cleansing healing stone has a tremendous crystal meaning.